While it is not possible to spot-reduce to get rid of stomach and bottom fat, exercising regularly on an elevated treadmill will help you burn calories and lose weight in your entire body. Pairing a vigorous treadmill workout with a low-calorie diet helps you burn fat from all over your body, including that stubborn fat on your belly and bum. Elevating a treadmill, also referred to as increasing the incline of a treadmill, is designed to help simulate the running of hills and other elevated terrain. Running up hills burns calories at a higher rate than running on a flat surface because of the increased effort required by your legs and cardiovascular system. 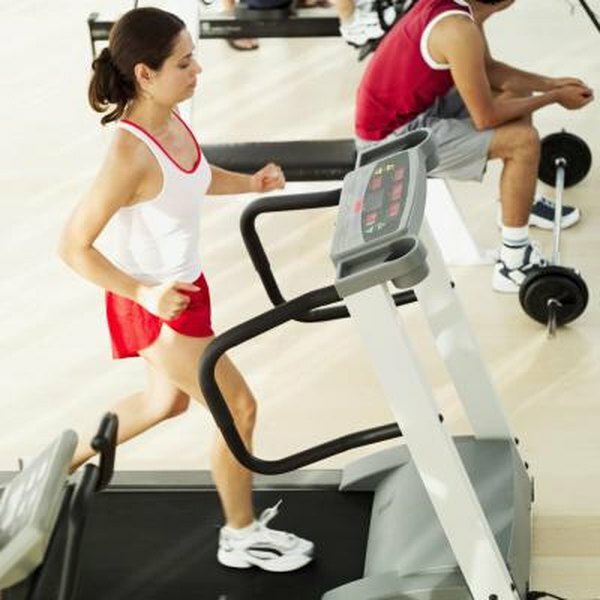 Increasing the incline on a treadmill mimics and provides similar benefits as running up hills. To elevate your treadmill, simply push up on the incline arrow on your treadmill to raise the front of the platform and increase the angle at which you are running. If your primary goal is to lose weight on the treadmill, elevating the treadmill is one of several elements that go into the overall reduction of your weight. Increasing your distance while running on a treadmill takes more time. This longer workout increases the amount of calories you end up burning overall. Speed is another element that can help you burn calories at a faster rate. As your speed increases, your body burns more calories because it is working harder to keep all of your muscles moving at a faster pace. Increase your time and speed in small increments as you get stronger; starting out too long or too fast can lead to injury and frustration. In addition to increasing the incline on your treadmill, setting your treadmill to an interval training program will allow you to run at an incline for longer periods of time because of the recovery time that is integrated into an interval run. For example, an interval run might start with you running at steep incline for a minute or two. Then, the treadmill will shift its angle back to a flat surface, allowing you the chance to reduce stress on your leg and calf muscles while still running. This pattern will repeat continuously for the duration of your interval workout. While elevating a treadmill can help you lose fat from your stomach and rear end, it is important to use proper precautions when engaging in a high-intensity workout or exercise. Talk to your doctor to make sure you are healthy enough to engage in intense physical exercise. If you have had any prior leg, knee or foot injuries, make sure that running for extended periods of time at an incline will not cause pain to the injured parts of your body. If you do experience pain while running, get off the treadmill and stop your workout.